Stalin’s gulag, impoverished North Korea, collapsing Cuba...it’s hard to name a dogma that has failed as spectacularly as socialism. And yet leaders around the world continue to subject millions of people to this dysfunctional, violence-prone ideology. 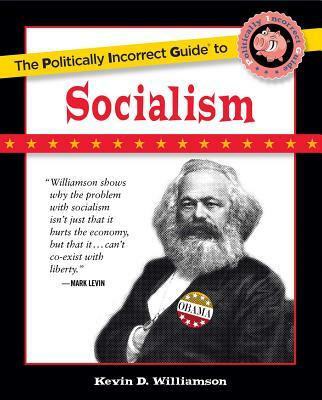 In The Politically Incorrect Guide™ to Socialism, Kevin Williamson reveals the fatal flaw of socialismthat efficient, complex economies simply can’t be centrally planned. But even in America, that hasn’t stopped politicians and bureaucrats from planning, to various extents, the most vital sectors of our economy: public education, energy, and the most arrogant centralplanning effort of them all, Obama’s healthcare plan. In this provocative book, Williamson unfolds the grim history of socialism, showing how the ideology has spawned crushing poverty, devastating famines, and horrific wars. Lumbering from one crisis to the next, leaving a trail of economic devastation and environmental catastrophe, socialism has wreaked more havoc, caused more deaths, and impoverished more people than any other ideology in historyespecially when you include the victims of fascism, which Williamson notes is simply a variant of socialism. If you thought socialism went into the dustbin of history with the collapse of the Soviet Union, think again. Socialism is alive and kicking, and it’s already spread further than you know. Kevin D. Williamson is deputy managing editor of National Review, a columnist for The New Criterion, and an adjunct professor at The King's College, New York City. His work has appeared in the New York Post, Commentary, Our Sunday Visitor, The Indian Express, and other publications. A frequent commentator on politics and economics, he has appeared on the Glenn Beck Show, the Kudlow Report, NPR, the CBS Evening News, BBC, Power & Politics, and dozens of talk-radio programs. A native of West Texas, he currently lives in the South Bronx.